Coney Island has a public beach and a classic boardwalk that extends for two and one half miles. The boardwalk is vibrant during summer weekends and attracts a wide mix of people, including joggers and bicyclists. New York City is planning to replace the wooden planks with concrete, so take a walk on the wood while it's still here. 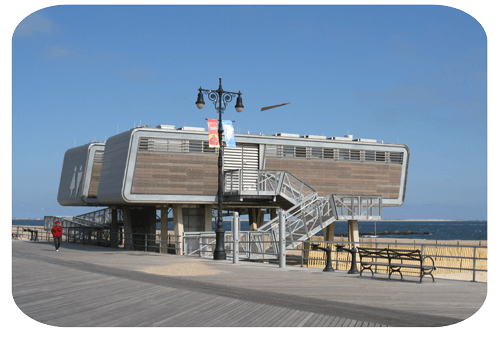 Some people feel that the area of the beach closest to the Stillwell Avenue subway station can get crowded on summer weekends, even though the beach itself is quite large. If you prefer a little more quiet and space, try heading a little east towards Brighton Beach, where the new Space Age bathrooms were built after Hurricane Sandy.